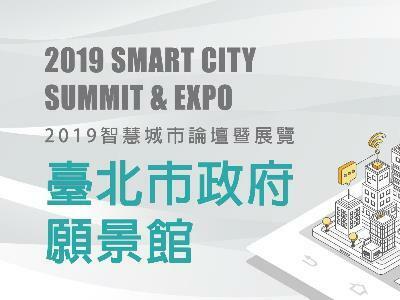 The 2019 SMART CITY SUMMIT & EXPO will be held from March 26th through 29th at the Taipei Nangang Exhibition Center Hall 1. Taipei City Government spotlights the principle "livable and sustainable city" as the theme to create the Taipei Pavilion. 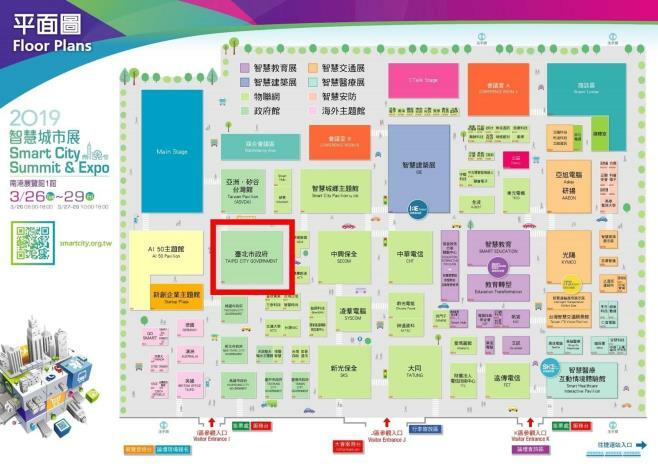 According to the Department of Information Technology (DOIT), Taipei City Government has set up 7 exhibition areas this year, including Smart Transportation, Smart Public Housing, Smart Medical Care, Smart Education, Smart Startup, Smart Security, and Smart Government to showcase more than 30 applications and services at the Taipei Pavilion. On the opening day (March 26), Mayor Ko Wen-je and BRAVO, the mascot of Taipei City Government, will also visit the Taipei Pavilion to show the determination for building a smart city. DOIT pointed out that the Taipei Pavilion features an interactive experience area and showcase various scenarios, allowing visitors to experience and “feel” the reality made possible by smart solutions when they visit the exhibition. To create a friendly environment for visitors, we offer in-depth guides to the applications and services through showroom tours service, providing those interested with full details. Moreover, Taipei Pavilion will invite the city staff member and celebrity HUANG CHING YIN to organize a livestreaming session for netizens, while visitors at the site can enjoy a fun and interactive stay at the exhibition. Furthermore, Smart Security showcases innovative applications across different fields, including ”Digitalized Officer Patrol System”, “Intelligent Management of Road and Pipeline Construction”, and “Disaster Prevention App” which are related with ensuring the safety of citizens. Smart Education provides innovative digital education, spanning the areas of robotics to programming. There are also on-site interactive games offering gifts and prizes, as well as quizzes. The organizers welcome people interested in smart cities to visit Taipei Pavilion, to learn more about a blueprint for the future under Taipei’s smart city initiative. Smart Public Housing: Taking Guang-zi Public Housing Community as an example, we’ve introduced a smart public housing project – complete with intelligent management based on cloud technology, Drone Patrol Autopilot Technology of Smart Surveillance, and Facial Recognition System. There will be a showcase using VR technology to allow visitors to simulate a visit at the public housing community. Smart Transportation: This exhibit provides a number of IoT urban transportation solution services including “Joint Traffic Management Center”, “smart stations”, “smart buses”, and “4U transportation”. Electric cars and motorcycles, and smart parking system equipment will be displayed at the venue to promote concepts of green transportation to the public. Smart Education: The organizers use the latest technological equipment to combine six courses in teaching, including “Taipei city 3R technology center”, “AI Robot”, “Smart Agriculture”, “AI Strandbeast and Mechanical arm”, “CooC-Cloud” and “OnO online courses”. Visitors can choose the desired course through the electronic scheduler at the entrance. They may watch their own learning journey at the exit after they “completed” the coursework. Smart Medical Care: The Department of Health and Taipei City Hospital jointly planned the display area to showcase “Dementia-Friendly Communities & Technology”, “EyeATM”, “Comprehensive health education on eye protection by smart robot Eye-Q”, “The Food and Drug Inspection Map of Taipei” and more, presenting the future with comprehensive care to safeguard the health of the citizens. Smart Startup: The Taipei Smart City Project Management Office (TPMO) was established by the city government. Working in collaboration with industry partners, the involved parties implemented numerous innovative projects, including the projects being displayed at the venue such as "iTrash Smart City Garbage & Recycling Integration System”, “AI Applications Project”, and “IoT Applications Project”. Taipei Flower Auction will demonstrate the onsite Flower Information Auction System to simulate the daily live flower trade transaction. Smart Security: In order to showcase the smart innovation for our police force, Taipei City Police Department introduced innovative applications such as TCPD WORK Smart Platform, Taiwan Oh My Guard App, 119 Video Call App, Taipei City Disaster Prevention App, Intelligent Management of Road and Pipeline Construction, and IoT Monitoring System and Data Visualization Platform. The objective of these platforms is to create a livable city providing safety and security for its citizens. Smart Government: This zone showcases the key policies promoted by the Department of Economic Development such as Circular Taipei, Smart Grid, and Promotion of Photovoltaic system. The Department of Land Transportation organized Taipei Land Cloud Service, while DOIT will demonstrate the cashless payment services known as pay.taipei.